For your child, losing their first tooth, or any baby teeth for that matter, can be exciting! They might ask you, “what do I do with my lost tooth?” Well, you simply place it under your pillow at night and when you are fast asleep the tooth fairy will come and whisk your tooth away leaving behind a special gift just for you! 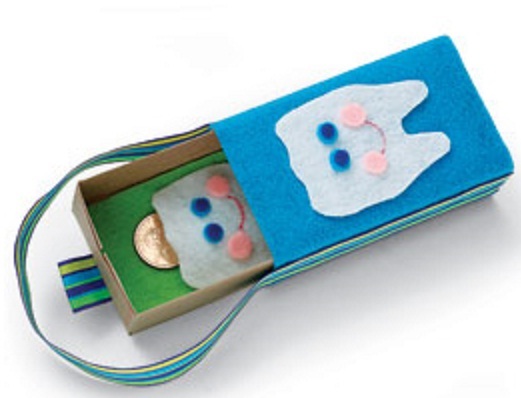 Here’s a great craft project for you and your child from Disney that will make the tooth fairy’s job a little easier and give their tooth a special place to stay until it is taken away. Step 1: Pull the inner tray out of the box and line the inside with glue and felt as shown. Wrap the outside of the box with felt and glue it in place. Step 2: Glue ribbon to the outside of the box in a hanging loop shape. Fold another piece of ribbon in half and glue it to the bottom of the inner tray to create a handle for sliding it in and out. Step 3: Draw a tooth shape on paper, cut it out, and trace it onto the white felt twice. Cut out the teeth and face details. Step 4: Decorate the teeth with the eyes and cheeks and draw on a mouth. Glue one tooth to the outside of the box. Step 5: Create a tooth pocket by applying glue to the sides and bottom of the remaining tooth as shown, leaving an opening at the top. Glue the pocket to the inside tray. Once the glue dries, the box is Tooth Fairy-ready. Now your child can put the tooth inside the inner pocket and hang it outside their door before they go to bed! We hope you enjoy making your Tooth Fairy Box!